Russian cooperation which builds Chinese military capabilities is more important and more detrimental to Western interests than any grand rhetoric coming out of officials’ mouths. This post is part of a debate on Bobo Lo's Lowy Institute Paper A Wary Embrace. Other debate posts can be found here. Is the relationship between China and Russia just an axis of convenience – a limited partnership with no real empathy between the two parties, spiced by deep-seated and well-hidden mutual mistrust? Or is it an emerging alliance of revisionist authoritarian powers which marries Beijing’s growing economic power with Russia's brazenness to challenge the international liberal order? And more importantly, what are the challenges posed by growing rapport between China and Russia to Western interests and leadership? To address these questions, one needs to unwrap the Sino-Russian relationship from many layers of myth, spin-doctoring, and old wisdom projected onto current developments. To arrive at a realistic assessment, a comparative benchmark is important. It's easy to dismiss progress in Sino-Russian relations once one starts to compare hard realities to propaganda on both sides. Another way is to argue that partnership between Beijing and Moscow is not deep and thus the West shouldn't fret about it. We can do this by comparing Sino-Russian economic ties to China's trade with the US, or by contrasting military cooperation between the two powers to US-led alliances in Europe and Asia. One soon arrives at fairly predictable conclusions – virtually any relationship that China might establish with Russia cannot compare. In the same vein, for Russia, no economic relationship with China can substitute for its dependence on European markets. This static, black and white picture, so common in many Western capitals, obscures important developments in Sino-Russian relations, which start to surface once one tries to compare current developments to the state of the ties some years ago before the global financial crisis and Crimea annexation. One of the many merits of Bobo Lo's Lowy Institute Paper, A Wary Embrace, is that he has included post-Crimea developments in his analysis. Scarce and misleading data is another obstacle for an inquisitive scholar of Sino-Russian ties. Take, for example, Chinese investment in Russia. According to a Chinese Ministry of Commerce announcement, China's cumulative investment in Russia since 1991 stands at $14.2 billion – a farthing compared to Western investments during the gilded age of the commodities boom. However, this figure is deceptive since it doesn’t include transactions through offshore jurisdictions. Beijing has recently calculated a more realistic figure by polling Chinese companies that have invested in Russia. As a result, the Chinese have arrived at US$40 billion of cumulative investment by the end of 2016, with about quarter coming after the Crimea annexation. Rigorous cross-checking of data, verification of claims made by officials and businesspeople on both sides (including conversations by the very same people with their Western counterparts, which provide different facts than in face-to-face Sino-Russian meetings) show a complex and dynamic picture, well presented in Lo’s A Wary Embrace. This is a picture of deepening ties between Eurasia’s two largest powers, and a growing asymmetrical interdependence between them in which Russia is the needier partner. The relationship remains transactional and rocky, and expectations on both sides haven't been fully met. However, measured against Sino-Russian standards, the relationship is becoming deeper and the level of trust between Beijing and Moscow is growing. This is not without implications for the West. 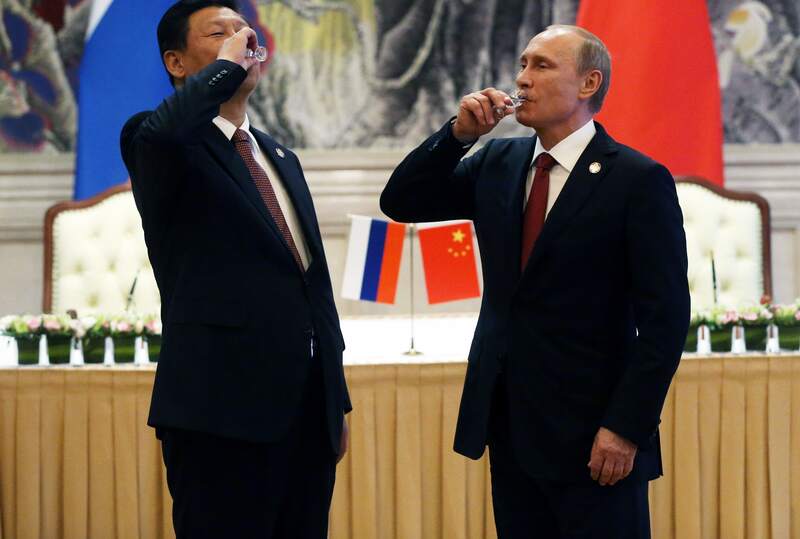 On the Russian side, Beijing has marginally helped Moscow to withstand Western economic sanctions. Chinese banks are generally compliant with the sanctions regime, but policy banks have channeled much-needed funds to companies of Vladimir Putin’s cronies. More importantly, China has supplied some critical technologies including underwater electrical cable going from mainland Russia to Crimea, which helped Moscow withstand the Ukrainian economic blockade of the occupied peninsula. Some of these efforts are beginning to challenge the position of Western companies in the Russian market, particularly in the IT and telecommunications sector where Russian SOEs and ministries are busy replacing Western equipment with products made by Chinese competitors. But it is on the Chinese side where Sino-Russian cooperation is affecting Western interests in a more dramatic way. Soon after sanctions were introduced in 2014, Moscow rushed to sell China Su-35 fighter jets and S-400 missile-defence systems. These two procurements will significantly boost China’s capabilities in the East China Sea and the South China Sea. Before Western sanctions, Russia was reluctant to sell China its most advanced weapons, fearing reverse-engineering and potential use of these weapons in any conflict with China over Siberian resources. Now these fears are gone. The Kremlin was forced to conduct a rigorous interagency study of potential risks of partnering with Beijing, and many previous worries were dispelled. Now Moscow is more concerned about the closing window of opportunity in the Chinese arms market due to rapid advances in domestic R&D. The Su-35 and S-400 deals signal a reverse of a long-standing Kremlin policy, and more arms deals are likely to follow. Russian cooperation which builds Chinese military capabilities is more important in practical terms and more detrimental to Western interests than any grand rhetoric coming out of officials’ mouths. Cooperation between Beijing and Moscow on issues of mutual concern, like THAAD deployment on the Korean Peninsula, may follow this pattern - look for small-scale practical steps which could be aimed at THAAD such as planning for cyber operations, information sharing on missile-defence, and additional sales of S-400 systems. Lastly, there is the question of global governance. Neither Beijing or Moscow are visionary superpowers which have more attractive values to promote globally. In many areas, China and Russia either have no alternative proposals to the current norms, or have conflicting views. But the similar nature of their authoritarian systems, and the position that both countries occupy in international fora (most notably the UN), make them natural partners in constructing an international order that values sovereignty over universal norms. This is most visible in new domains of global governance like cyber or space, in which the international order is still a work in progress. Another dimension is joint work on ways to put pressure on civil society domestically. Sino-Russian collaboration and mutual borrowing of 'best practices' provides a ready template that authoritarian governments around the world can follow. Sino-Russian relations do not constitute a new axis of like-minded authoritarian regimes that want to challenge the West by default. But it’s an example of how tactical and opportunistic cooperation of non-Western powers seeking to boost their influence on the international stage comes at the expense of the Western-led international order. By Daniel Thambar, an intern with the Lowy Institute's Migration and Border Policy Project. The change is the equivalent of VHS versus live streaming, yet the market will not be a decisive factor in China. The thing that puts New Zealand on the world map is rugby, and New Zealanders will do everything in their power to retain their rugby primacy.